National recognition • The after-school program is one of 12 selected for an arts award. 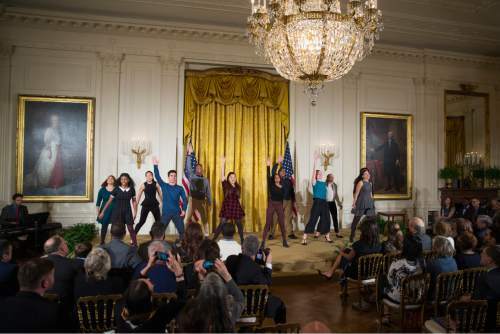 Evan Vucci | The Associated Press ATE II of New York, perform during the 2015 National Arts and Humanities Youth Program Awards on Tuesda in the East Room of the White House in Washington. The award goes to students representing 12 after-school programs from across the country and 1 international program. 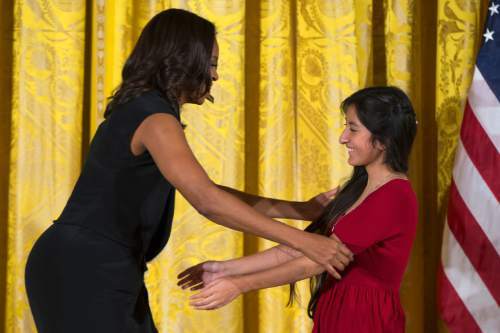 Evan Vucci | The Associated Press First lady Michelle Obama hugs Kitzia Rodriguez of Spy Hop Productions in Salt Lake City during the 2015 National Arts and Humanities Youth Program Awards on Tuesday in the East Room of the White House in Washington. The award goes to students representing 12 after-school programs from across the country and 1 international program. Washington • There were no audio glitches at the White House on Tuesday as after-school programs were honored by first lady Michelle Obama, but had there been an awkward squeal or a little feedback, Salt Laker Kitzia Rodriguez could have stepped in to help. Rodriguez, a 19-year-old University of Utah student, spent hundreds of hours after school learning audio mixing and editing through Salt Lake City-based Spy Hop Productions, which was one of 12 programs in the country to earn the 2015 National Arts and Humanities Youth Program Awards. "I&apos;ve always said I never lost anything going to Spy Hop. All I&apos;ve done is gain like really positive things," Rodriguez said after the short ceremony, still beaming from hugging Obama. "I&apos;ve gotten experience; I&apos;ve gotten friends for life. It&apos;s just been a completely positive experience." About 20,000 students have flowed through Spy Hop&apos;s programs since its founding in 1999, and nabbing national recognition could help boost its cachet. The award honors the nation&apos;s best after-school programs and Spy Hop was chosen from a pool of 285 nominees. Spy Hop "is changing the way young people see themselves," said George Stevens Jr., co-chairman of the President&apos;s Committee on the Arts and Humanities, in presenting the award. Stevens noted that 86 percent of students involved in Spy Hop go to college and 40 percent of its alumni work in the media industry. Spy Hop&apos;s mission is to mentor young students in the digital media arts through hands-on programs in film, audio, music and design. Executive Director Kasandra VerBrugghen says the type of programming that the group offers helps ensure the next generation has essential skills, support and passion for the arts – but also the passion for themselves and their work. "I&apos;m hoping that will really elevate us to the next level," she said at the White House. "You know it will ensure that this organization is a thriving organization within the community." As part of the award, Spy Hop will receive a $10,000 grant. Obama, who joked that she would stay put all day to hug every kid at the awards ceremony, said such after-school programs don&apos;t just expose kids to the arts and humanities but they also teach problem solving, discipline and teamwork. "And these skills aren&apos;t just important in the photo lab or on the stage; they&apos;re also critical in the classroom," the first lady said. "They will be critical in the boardroom. And, frankly, they&apos;re skills that you&apos;ll use when you wind up here one day at the White House  because I know some of you are headed here." Rodriguez, who got one of those Obama hugs, had a private conversation with the first lady while on stage, but she didn&apos;t want to share the contents. "I&apos;m going to keep it a secret," she said, grinning. "It&apos;s just for me."